It had been nearly 15 years since my three cousins and I traveled to Powell, Wyo., along with dozens of volunteers from the Japanese American National Museum to bring back two original barracks buildings from the site of the camp. It was a life-changing event as I came face-to-face for the first time with what our parents and grandparents endured when they suddenly found themselves in the dirt, dust and extreme weather of this godforsaken place in the middle of nowhere. When I returned last week for the Heart Mountain Pilgrimage, even though we had previously spent almost a week in Wyoming, I still felt a stranger to the local area that surrounded the thousands of acres that once housed more than 10,000 Japanese Americans. To my surprise I couldn’t even tell where the camp had been. Were it not for the landmark Heart Mountain Interpretive Center as a focal point (since the well-known heart-shaped peak was unfortunately covered in clouds), I’d probably still be wandering around the 30-some miles between Cody and Powell. Lucky for me, Bacon Sakatani, aka “Mr. Heart Mountain,” generously offered to drive me around to try and locate some of the remaining barracks that still dot the landscape there. I remembered when Bacon led the charge to bring those barracks back to the museum by finding and securing them from their original owners, and he took me to several of the places where he had found them. We were lucky enough to find Wyoming farmer Tak Ogawa at home, taking a break from his busy harvest season due to rain, as we reminisced about his donating a section of the barracks he received as an original homesteader back in 1949. The tour was important to me as part of my new project to locate the 275 or so barracks buildings and remnants thus far identified by a professor at the University of Wyoming who is currently studying their significance to the Wyoming landscape. I learned that as part of the government’s program of granting land to homesteaders when the camp closed, the participating farmers were each given two barracks, complete with pot-bellied stoves, to use as homes, sheds or whatever. I also discovered that living inside these barracks for these homesteaders was not much different than what the camp inmates endured. In oral histories, they spoke of the bitter cold winters, the wind roaring through cracks in the barracks walls, and lack of insulation that caused a wet rag to freeze minutes after it hit the floor. This was only part of the continuing education I received on my journey back to a place that represented the history my parents seldom discussed. Thanks to the enthusiastic and well-organized Heart Mountain Wyoming Foundation, the story continues to be told through insightful exhibitions in addition to this annual event. 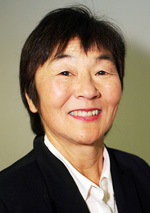 This year, it brought such luminaries as former members of Congress and longtime friends Norman Mineta and Alan Simpson, Irene Hirano Inouye, and historian Eric Saul to address an audience of pilgrims eager to reconnect and learn more about what occurred more than 70 years ago. With this year’s theme of “Honoring Selfless Service,” the program paid tribute to Heart Mountain veterans, sadly too few in number at the weekend program. Attendees included the descendants of such disparate JA heroes as Clyde Matsumura, a member of the 522nd Field Artillery Battalion involved in the liberation of Jewish prisoners at Dachau, and Minoru Yasui, one of a handful of people who defied the West Coast curfew order. I was delighted to see former Heart Mountain incarcerees George Iseri, one of the hard-working members of the original barracks team there, along with Nori Uyematsu, who was returning for the first time in 69 years. It was wonderful watching Nori reunite with retired judge Raymond Uno; they were two young boys who met on their very first day at the Pomona Assembly Center and remained friends ever since. 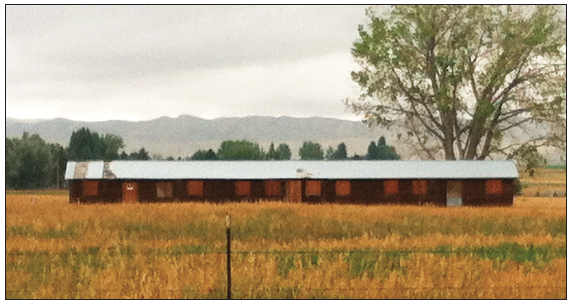 One of a few remaining complete barracks buildings from Heart Mountain found in Cody, Wyo. Wonderful stories like theirs abounded during the short two-day event overseen by foundation chair Shirley Higuchi, whose parents met as teenagers at Heart Mountain and went on to become ardent supporters of the Interpretive Center. As Higuchi aptly put it, there seemed to be just a few degrees of separation among all of us whose lives were forever changed by camp. JA community events such as this pilgrimage were so wonderful in bringing up the immeasurable connections oftentimes made between people whose relatives knew friends who knew other friends, and so on and so on. It’s this interrelated community that made everyone feel part of something far greater than themselves as we gathered from all over the country to pay tribute to the brave men who once fought for this country. Such interestingly diverse people as Brian Liesinger, executive director of the Heart Mountain Wyoming Foundation, and Rafu columnist George Yoshinaga are set to attend, and it promises to be a lively afternoon of reminiscing and reconnecting.